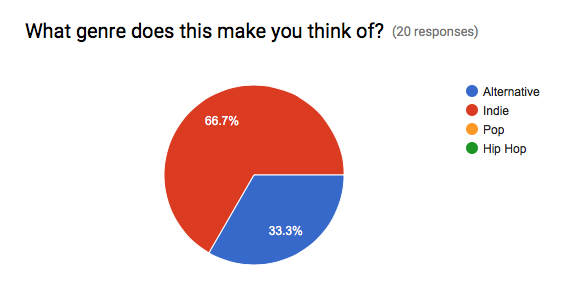 Now that I have had a sufficient number of responses from my survey, it is important for me to analyse the results and relate it to my magazine. 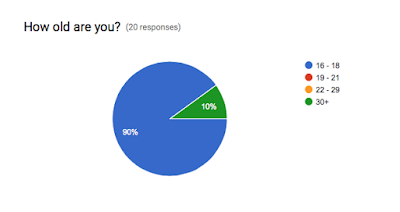 The large majority (90%) of people who filed out my survey were in the 16-18 age range: this is useful to my magazine because my desired audience was of a younger demographic. However, the fact that 10% of the responses were in the 30+ age range suggests that my magazine could provide interest to older readers - perhaps those who are looking for nostalgia, or who are simply intrigued by the new music scene. 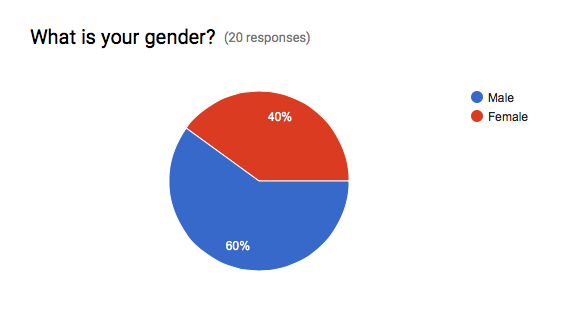 My magazine will be directed towards both male and female reads, so the fact that the survey is fairly evenly split (60% male, 40% female) suggests that this is easily achievable. It is important that my magazine can appeal to both genders, so I will need to create a design/aesthetic that is widely approachable - this does not mean that I will be using "gender assigned" colours or stereotypical designs. When asked what genre my pitch was reminiscent of, nobody chose "Pop" or "Hip Hop". This is a really positive result for my magazine because it isn't associated with those genres at all. Instead, people chose "Indie" and "Alternative": strictly speaking, my magazine is one that focuses on alternative music, however I feel that indie is a fairly broad term when it comes to music outside of mainstream. Therefore, it is good that 66.7% of people decided that my magazine is "Indie" because I can now know confidently that my magazine has achieved its desired style. As well as this, 33% associated my magazine with "Alternative" - this is positive as my magazine is centred around alternative music (particularly shoegaze/dream pop). Before this survey, I planned to sell my magazine monthly - at a price of £8. 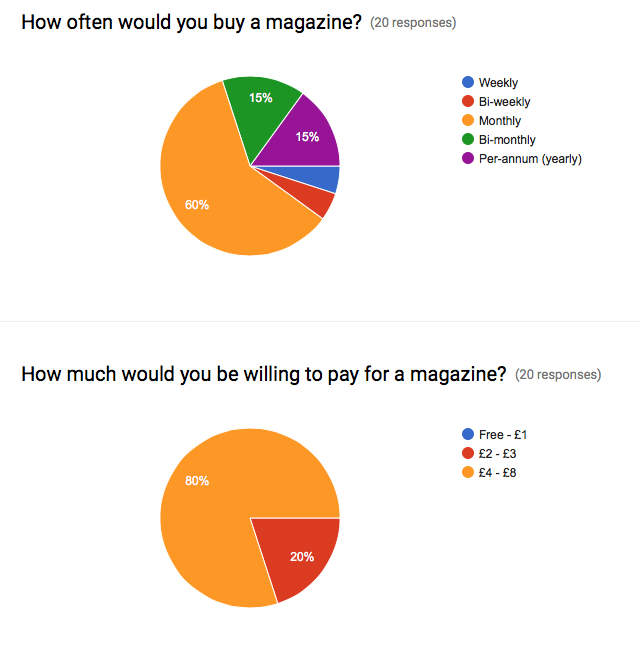 After surveying my desired consumers, I received incredibly positive results: 60% said they would buy a magazine monthly, and 80% stated they would pay £4-£8. This really reflects how I want my magazine to be sold, and provides evidence that a monthly, £8 magazine would be suitable for my consumers.